This example has two sets of grouping symbols: parentheses () and brackets . When an expression has more than one set of grouping symbols, start with the innermost symbols and work out from there. In this case, we need to start with the 6 squared inside the inner parentheses. Once we simplify that, we need to keep simplifying what's inside the brackets next. This gives you 6 + 4. At this point, you're left with two operations: addition and multiplication. 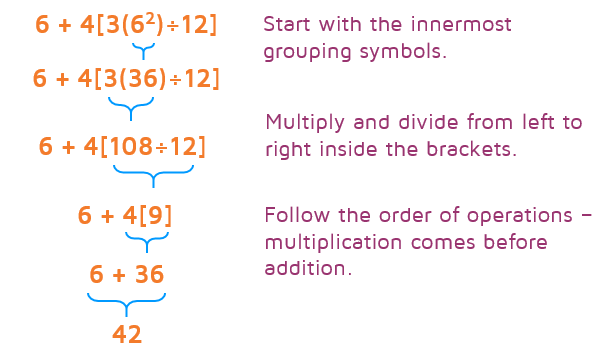 Multiplication comes first in the order of operations, so you need to multiply 4 and 9 together first and then add 6 as the last step. A common mistake in the example above is to multiply the 3 and 6 together and then square it. Make sure to remember that exponents come before multiplication. Ready to try using PEMDAS on your own? Click the START button below to try a practice quiz.